Mumbai, April 11: The world’s largest democratic election began in India on Thursday, with 543 seats in the lower house of parliament up for grabs and roughly 900 million eligible voters headed to the polls in seven phases through May 19. All votes will be counted on May 23 and an additional two members will be nominated by the president. 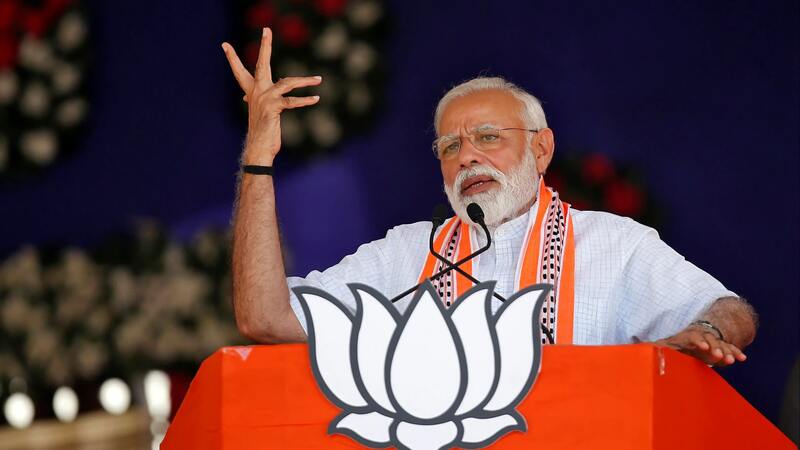 The governing Bharatiya Janata Party, or Indian People’s Party, headed by Prime Minister Narendra Modi, won a landslide victory in the last election in 2014 on promises of stronger economic growth and structural reforms. During its reign the BJP has been credited with such historic economic reforms as the introduction of the country’s first fully functional bankruptcy law and a value added tax, or Goods and Services Tax, which replaced fragmented indirect taxes imposed by states. India also achieved the fastest economic growth among the world’s major economies at over 7%, according to government statistics. But as elections neared with Modi’s second term at stake, public dissatisfaction over the administration’s handling of the economy began to emerge, with many Indians feeling left out of the economic good times. This dismay has given rise to numerous street protests by farmers demanding higher incomes and youths clamoring for better jobs. The protests have become increasingly common in New Delhi and other major cities over the past several months. The country’s biggest opposition party, the Indian National Congress, is hoping to capitalize on the current discontent. INC President Rahul Gandhi declared on March 25 that his party will carry out “justice for the poor,” promising a minimum annual household income of 72,000 rupees ($1,039) if voted into office. Families earning less than the minimum would be directly compensated for the difference, said the great-grandson of Jawaharlal Nehru, India’s first Prime Minister. Gandhi hopes this pledge will win him votes from the poorest 50 million households. According to opinion polls conducted by magazine India Today, Modi’s approval rating peaked at 65% in early 2017 then plummeted to 46% in January this year — the lowest since taking office in May 2014. Tellingly, his BJP failed to win a majority of seats in all five states in the December 2018 local elections. The Pew Research Center, an American think tank, released a survey at the end of March that showed 76% of voters were worried about a lack of employment opportunities. They also expressed concern about inflation, corruption, terrorism and crime. In addition, 51% of respondents worried about the growing gap between the rich and poor. The fall in Modi’s approval rating reveals a perception gap between the government — which touts India’s world-leading growth as its crowning achievement — and a large part of middle- and lower-income people, who complain about the lack of improvement in their lives. The Centre for Monitoring Indian Economy, an independent think tank, said the value of new investment plans by major Indian companies peaked in fiscal 2014 before falling to a 14-year low in fiscal 2018 ended March. Along with this, India lost an estimated 11 million jobs in 2018 alone, the center said. Furthermore, the Modi administration has fueled suspicion over the credibility of government statistics by withholding official labor force and employment data, despite the numbers being authorized for publication in December by the government’s supervising body. A leaked version of the labor numbers showed that India’s unemployment rate for fiscal 2017 stood at 6.1%, the worst ever since the statistics became available for 1972. Modi has rejected complaints about inflated economic numbers and the worsening employment situation as political posturing by opponents. “There are some who feel disheartened by India’s growth and success,” he said, pointing his finger at opposition politicians in a March speech and calling for voters to “punish” them. Arun Jaitley, Modi’s finance minister, dismissed claims of high unemployment, saying in early February that it is “absurd” to say there are no jobs in an economy growing at over 7% in real terms and over 10% in nominal terms. “I know one minister has said how can we be growing at 7% and not have jobs. Well, one possibility is that we are not growing at 7%,” he said in an interview on Indian television. Furthermore, Rajan has been pointing out that the 7% to 8% real-term growth is not enough to maintain job creation in India, where over 12 million people are added to the working-age population every year. Rajan’s remark indicated that India has much greater potential, given its demographics and stage of development, and that government leaders should not be satisfied with single-digit growth. China’s gross national income per capita reached $8,690 in 2017 — compared with India’s $1,800 — as its economy maintained double-digit growth on average over two consecutive decades from 1990 through 2010. The Indian economy will need to see several years of double-digit growth for the country’s living standard to catch up with that of China. The Chinese economy has been largely powered by a huge labor force comprised of people leaving rural villages for factories in the cities, resulting in skyrocketing productivity and rapid income growth across all income levels. China’s poorer half saw incomes more than quadruple in the 34 years through 2014, while incomes for 90% of Indians failed to even double during the same period, according to the World Inequality Report released in late 2018. Today farmers still account for half of India’s workforce of 520 million. As agriculture makes up only 15% of India’s GDP, the country needs to shift to a more industrialized society to achieve higher productivity and economic growth. Economists say many more reforms are needed to attain this, including promoting investments by both domestic and foreign companies, accelerating entrepreneurship and developing new cities, as well as simplifying complex labor laws. The general elections will decide whether the government will retain its ability to advance politically controversial legislation for further structural reform. If the result is a hung parliament, reforms needed to push the country into the ranks of higher middle-income countries as defined by the World Bank, which include China and major Southeast Asian economies, will likely find little traction.